Do you want to add email subscription to your WordPress blog? Recently, one of our users asked us what is the best way to subscribe by email option in WordPress? In this article, we will show you how to add email subscriptions to your WordPress blog and start building your email list. 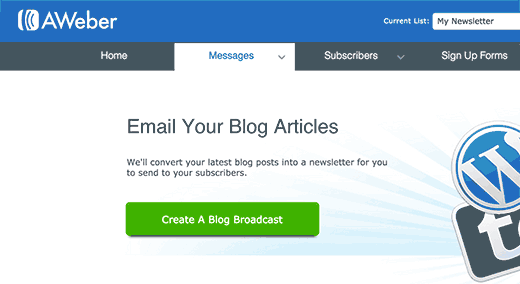 Why You Should Add Subscribe via Email Option to Your Site? While social media is a great way to interact with your readers, email is the most reliable and direct way of communication. By offering email subscription on your blog, you can build a steady stream of regular visitors for your site. Email subscription also gives your users yet another way to consume your content as some folks may not be on social media. See our complete guide on why you should start building your email list right away. Often beginners think that adding email subscription is some complicated process. That’s not true at all. 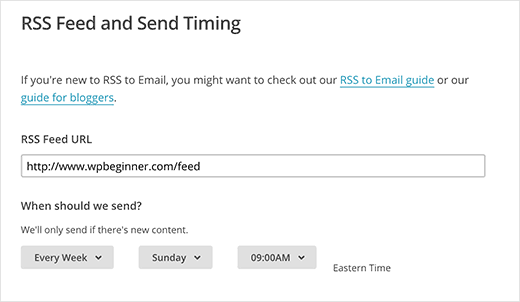 The WordPress RSS to email subscription setup is quite straight forward, and it will take you less than 30 minutes. 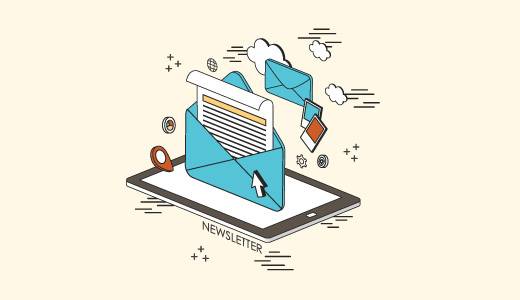 Once you set it up, your readers will automatically get daily or weekly emails containing your new content. Now since there are multiple services and plugins that allow you to setup email subscriptions in WordPress, we will only cover the top 3 email subscription plugins and services. MailChimp is one of the most popular email marketing service providers. It is a paid service, but they do offer a free option for those with less than 2000 subscribers. To quickly get started with MailChimp see our guide on using MailChimp and WordPress. 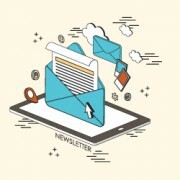 For the sake of this article, we are assuming that you have signed up for MailChimp and created your first email list. The next step is to setup an RSS to Email campaign. Simply visit Campaigns » Create Campaign to create a new campaign. MailChimp will now show you different types of campaigns that you can create. You need to click on the RSS Driven Campaign option. You will also need to choose the time and frequency of emails. You can choose to send daily, weekly, or monthly emails. On the next page, you will have to provide campaign info. You will notice that MailChimp has already pre-filled most fields on the page. These settings should work for most blogs, but feel free to change them as needed. Now you need to click on the next button to select a template for your emails. MailChimp allows you to customize the template by adding your own logo, by-line, and any other elements that you may want to add. When you are finished customizing, click on the next button and then click on Save and Exit. That’s all, you have successfully created your WordPress RSS to Email newsletter using MailChimp. To add the email subscription form to your website, simply visit the Lists page on your MailChimp account and click on the downward arrow icon next to your email list. After that select signup forms from the menu. MailChimp will then ask you, what kind of signup form you want to create. Select Embedded Forms. On the next screen, you can customize your email sign up form and generate the embed code. You can then copy and paste this code in a text widget on your WordPress website. Alternatively, you can use OptinMonster a plugin created by the WPBeginner team that will make this process a lot easier and offer you pretty signup forms, floating bars, slide-ins, exit-intent popups, and more. Aweber is another popular email marketing service provider. It’s a paid service, but they offer a 30 day free trial. A lot of bloggers and internet marketers prefer to use AWeber. If you are just joining Aweber, then you will be directed to create your first email list when you login for the first time. 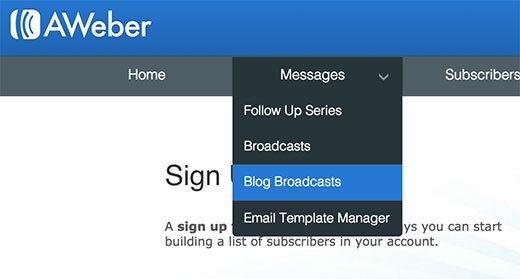 Once you are logged into your Aweber dashboard, simply visit Messages » Blog Broadcasts. On the next screen, click on the green button labeled ‘Create a Blog Broadcast’. 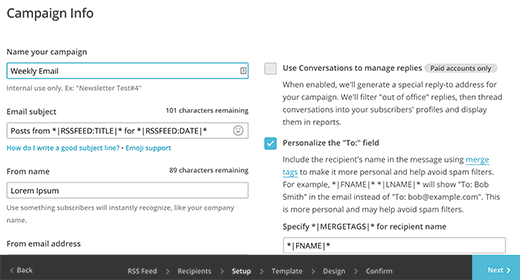 This will bring you to the new page where you can setup your RSS to email campaign. First you need to enter the URL of your blog’s RSS feed. After that you need to provide a subject line for the emails. Scroll down a little, and you can choose a template for your email. Select the one you like and then click on load template. 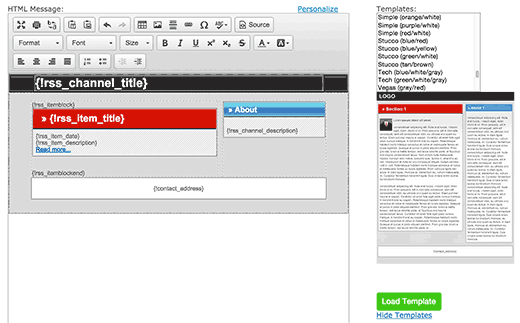 After choosing your template, scroll further down to configure time and frequency of emails. You can setup to send an email as soon as new item appears in your RSS feed. You can also send daily, weekly, or even monthly email digests. Once you are done setting up these options, you need to click on Save Blog Broadcast button. That’s all, you have successfully set up Aweber RSS to email subscription. 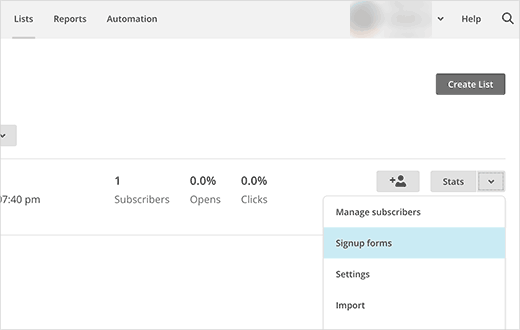 If you have not already added the email signup form to your WordPress site, then the next step is to add a signup form to your WordPress sidebar. 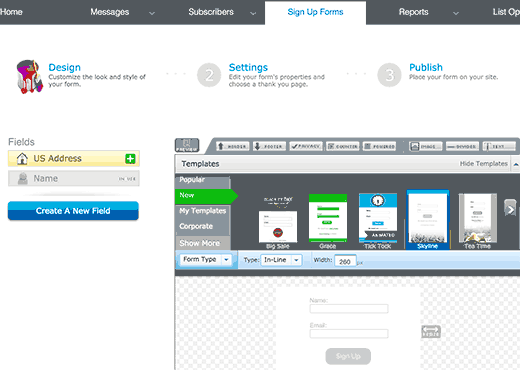 Simply click on the ‘Signup Forms’ in the Aweber dashboard to design your email signup form. Follow the on screen instructions and save your form. Finally you will reach the publish section. 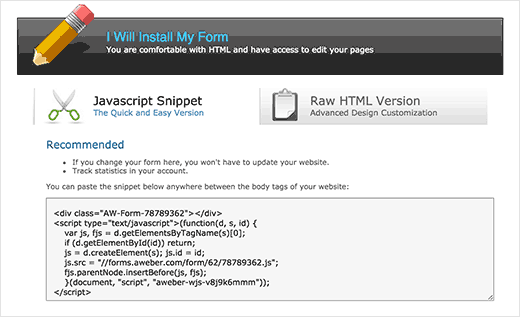 There you need to click on the ‘I will install my form’ button and copy the form embed code. Now go to Appearance » Widgets on your WordPress site and paste this code in a text widget. Jetpack is another option for users who want to add email subscriptions to their WordPress site. It is completely free, but the downside is that you don’t control your list. Jetpack Subscriptions is not a full newsletter. For example, if you wanted to send an email apart from your daily blog posts, then you will not be able to do that using Jetpack Subscriptions. Also, if later you decide to move to a proper email marketing service which most bloggers do, then your users will have to opt-in to the email list again. Having said that, here is how to add Jetpack email subscriptions to your self hosted WordPress site. First thing you need to do is install and activate the Jetpack plugin. Upon activation, the plugin will add a new menu item labeled Jetpack to your WordPress admin bar. Clicking on it will take you to the plugin’s settings page. Jetpack plugin requires you to create a WordPress.com account and link your site with it (See our guide on the difference between WordPress.com and self-hosted WordPress.org sites). If you have a WordPress.com account, then you can use that or you can create a free account. Once you have connected Jetpack to WordPress.com, you need to visit Appearance » Widgets. Drag and drop Blog Subscriptions (Jetpack) widget to a sidebar and then click on Save button store your widget settings. You can also enable subscription option below your comment form. Visit Settings » Discussion page and scroll down to the Jetpack subscription section. Check the box next to blog subspcription and comment subscription options. Click on the save changes button to store your settings. That’s all you have successfully set up Jetpack email subscriptions on your WordPress site. If you ever want to move to another email service, here is how to switch from Jetpack subscriptions to MailChimp, Aweber, etc. We hope this article helped you add email subscription to your WordPress blog. You may also want to check out how we increased our email subscribers by 600% using OptinMonster. While there are dozens of other plugins and services that allow you to setup email subscriptions for your WordPress blog, above are the ones that we recommend. For those who are wondering, we use MailChimp and OptinMonster to handle WPBeginner email subscriptions. Here’s a tutorial on how to create a daily and weekly email newsletter in WordPress similar to WPBeginner. We hope this article helped you learn how to properly add email subscriptions to your WordPress blog. You may also want to check out our email marketing 101 guide to kickstart your email list. Can you show me how to successfully add youtube subscribe button on my wordpress site ! Great article for a newbie!!! Please could you help me with something. The website I’m building (migrating from Business Catalyst) has some custom templates which would be a nightmare to put into a theme. But is it possible to choose a WordPress theme which is only applied to the blog and the homepage which are much easier to change? Hi, I like to have a plugin which sends notifications to subscriber when a new page (not post) is published. The subscribers list should remain with WordPress and not on email marketing sites. Please suggest a plugin. Thanks for sharing……it really works…..! I appreciate your super helpful site! I’m trying to add a signup for people to subscribe to my WP blog posts. Mailchimp shows my mailing address on a confirmation window. For a simple RSS email signup, how do I avoid showing my mailing address? I’ve seen it done on other sites. What service will do this (it seems Mailchimp won’t)? I am also having this problem. Not interested in broadcasting my mailing address to the world. Why does Mailchimp say my blog feed isn’t valid? Do I have to publish a post before it becomes valid? My blog isn’t ready yet and is in “coming soon” mode. Hi there, I have just had a ‘new user’ subscribe to my blog which is on WordPress.org. What does this mean? Can they now access the dashboard and all my posts? You can go to your WordPress admin area and click on Users. On this page you can see all users who can log into your WordPress site. Next to each user you will be able to see their user role. If a user appears as a Subscriber and you didn’t add them, then you can delete that user. You may also want to visit Settings » General page and look for the Membership option. If the box next to ‘Anyone can register’ is checked, then you can uncheck it and save your settings. On the main page of my website, i am seeing 55000 subscribers but where I can found this list? Depends on which tool you are using to collect email addresses. If you are choosing an email marketing service, then you’ll find your list by signing into your account. If you are using a WordPress plugin, then check out plugin’s settings page. Is there a way to have an email sent to a subscriber every time that single page is updated? Not to the whole site, but just a single page of the site? This would give followers the option to only be notified when a specific portion of the site is updated. I have the same question. I am running a genealogy blog and I know there are going to be people who will want to be notified when I am working in a particular category/surname. But until that time, they won’t be needing my feed…. and might stop reading or unsubscribe. Are there any follow by email services for blogs that don’t require having a physical address? I got Mailchimp all set up only to find out my physical address has to be displayed with the messages and as a blogger I don’t require a PO box nor do I want readers to see a physical address. I’m at the part to click the “RSS Feed” for the campaign but they don’t list that as an option. I have the top 3 options but the fourth is “Automated”. Have they changed this? Do I need to do something different? Yes, it has changed a bit since then. We will update the article soon. Meanwhile, go to your MailChimp dashboard and click on the Add Campaign button. From the popup menu select ‘Let us Guide you’. In the next step, select ‘Connect with new contacts’, and then select Share Blog updates. For pop up functionality you may want to checkout OptinMonster. It is a lead generation software that helps you grow your email list using beautiful email signup forms including lightbox popups. MailChimp works only about half the time for me. I post at the same time every day and have the notice go out two hours later. Sometimes it does, sometimes it doesn’t. Do you have any idea why? Very helpful still in 2017, thanks. 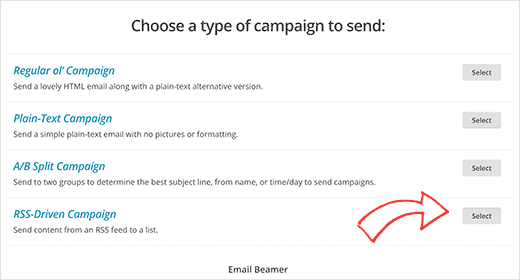 Mails that are sent through via MailChimp campaign to my subscribers does not appear in their inbox, instead they are stored directly in the promotion section. Why does that happen? Is there any way to make them appear in the inbox? Hello. Can someone please reply this reader? I think she asked a valid question. Thank you. Gmail automatically sorts email and sends them to promotions or updates tabs. Users can decide whether they want to see an email into their primary tab. Many Gmail users actually turn off the tabbed email view to only view the primary inbox. A recent Study by ReturnPath showed that promotions tab does not affect your email’s deliverability or even its open rates. But if you are still concerned, then you can ask your subscribers to move your email message from promotions to primary by showing them instructions on how to do that. Does anyone know how frequently Jetpack Subscriptions sends out notification emails when I post new content on my blog? Is there a way to configure how often/how quickly notifications get sent? Thanks. Use Better Notifications for WordPress plugin, it will allow you to configure your email notifications. I am trying to switch to Mad Mini. I have a custom sign up button on my site, but don’t know how to connect Mad mini to my site. Help. Please contact Mad Mimi for support. I have just started making my own blog, on WordPress. After few post, i am getting good no of users as well views but this views do not convert into subscription very well rather the result is zero. My only E-mail subscription widget is at footer widget area. Now after reading your article, i am going to place two more subscription widget. One will be at Top sidebar and another will be at the last of the content. So thanks for your great Article. Glad you found it helpful. You may also want to follow us on Twitter for more useful WordPress tips and tutorials. Ah! FINALLY the answer to getting the Subscribe widget on a self-hosted blog! Thank you! I set up the RSS feed via MailChimp within an hour. You made this SO easy! Would you not recommend Feed-burner by Google? Is there a way i can make the Follow Blog Check box always checked? I went through all the steps using my Mail Chimp account but I can’t get the text widget in my wordpress.com site to accept the embedded code. Do I need wordpress.org site for this to work? Hello! I just activated Jetpack subscriptions on my website. I chose Jetpack just for the simplicity and I don’t really feel the need at this point to have access to the subscription list. Thanks for this article. God bless you. I am a subscriber to your newsletter. I must say i have enjoyed every bit of what you provide here. I am getting better with my wordpress blogs because of what i read on your blog. Thanks and God bless you again. MailPoet is another great option. It’s free up to 2,000 subscribers and just $75 a year for a single site after that and has some great email templates.